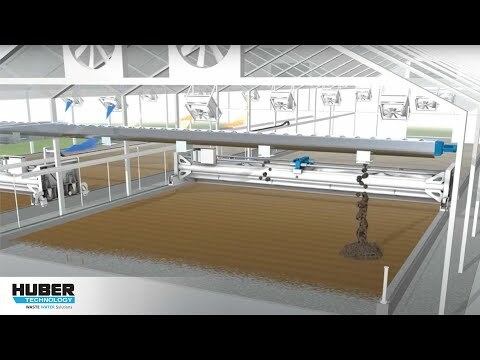 The basic principle of the HUBER SRT system is drying of sewage sludge in a glasshouse using the incident solar radiation. A special sludge turning system performs both spreading and turning of the sludge as well as its transport from one side to the other. The sludge feeding options can be adjusted to suit customer-specific requirements. The dewatered sludge can be fed into the greenhouse either manually, i.e. with a wheel loader, or fully automatically by a distribution screw that utilizes the evaporation area optimally. The dried sludge is discharged either into a trough, or by means of a belt conveyor directly into a container. Since the sludge is fed continuously, also units with a low throughput can be used for sludge dewatering. The rotating shovel of the turning device takes up the sludge and transports it along the granulation plate. As the turning device travels forward, the sludge is being transported.